Starts at: 7:20 PM. Meet inside lobby at 7 PM. RSVP to this message if you plan to attend movie. Danny Collins is a 2015 American comedy-drama film written and directed by Dan Fogelman in his feature directorial debut. Inspired by the true story of folk singer Steve Tilston, the film stars Al Pacino, Annette Bening, Jennifer Garner, Bobby Cannavale and Christopher Plummer. 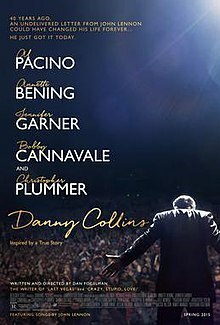 Aging 1970s rocker Danny Collins (Al Pacino) cannot give up his hard-living ways. But when his manager Frank Grubman (Christopher Plummer) uncovers a 40-year-old undelivered letter written to him by John Lennon, he decides to change course, and embarks on a heartfelt journey to rediscover his family, find true love and begin a second act.